Since I was a kid, I’ve been looking for the perfect way to read in bed. The ideal position would involve no sustained muscle effort, so I could just let my eyes drift shut as I read, without the book falling shut or my hand slipping or anything. One way is to sit up against something and hold the book on your lap, but that’s not great for falling asleep. So I usually end up reading on my side. The problem is, you have to hold the book to see both pages, and in either case, you’re using some muscles to hold it where it is. This has worked for most of my life, but it’s still not that ultimate relaxation. However, I recently got a Kindle. I was intending to use it mainly as a mobile web browser, but I’ve surprised myself by using it to read an awful lot. And, with apologies to all the bibliophiles out there, I find the ergonomics better than a paperback. 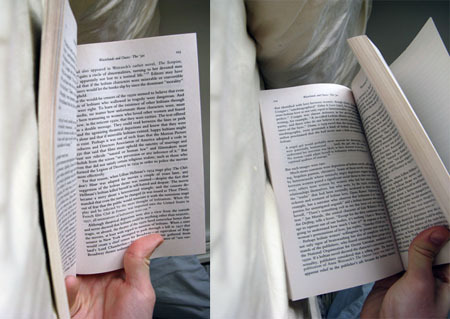 When snacking and reading, I can lay it flat on a table without the use of a book weight to hold it opened, and when lying in bed, I don’t have to keep moving it to read. Finally, after decades of reading in bed, I have reached that stage of perfect relaxation. Me and a buddy brought this to market. Sold only 200 so far! Check it out. This will gradually dim your bedside lamp over 30 minutes from full bright to off or full bright to night light. 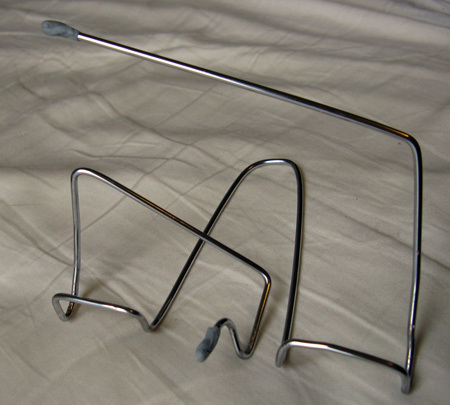 of all the DIY ebook stands i have found so far, this is the only one that is all about reading in bed and falling asleep while reading…. my usual routine. so far i had been using 4 cushions to hold my nook in position – a far from ideal solution. i’ll try this one and let you know 🙂 thanks a ton. I really your commitment towards laziness ( also known as being productive) , this is a very creative idea and an excellent example of an application of creative problem solving thinking skills. it got me thinking, great idea! I always prop my kindle on a pillow on my belly and turn on the “text to speech” function and turn the volume all the way down. Then it turns the pages for me so I don’t have to move anything but my eyes. 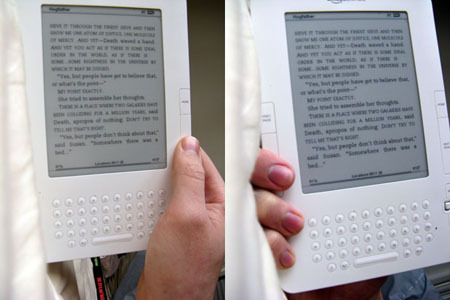 You can even adjust the speed so it keeps up with your reading speed. I also do this when I do the dishes. I prop it in the window above the sink and just read away. Bookwormish, yes, but better than dirty dishes. Wow!, amazing, where do I can buy it? 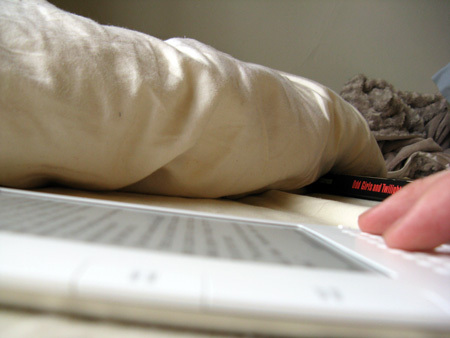 I have the perfect solution to turning pages on kindle while actually keeping hands tucked under pillow, while reading. I took a thick emery board (cushioned nail file), cut off rounded edge to square it off, applied first aid tape to end. I just poke next page with it, while hands are actually 8 away. I put the tape on, so next page button wouldn’t get scratched up. just takes a teeny poke, and next page appears! Its funny that you only mention being lazy as a reason not to turn the pages in bed. Some people find it very hard to do this because of arthritis or similar. 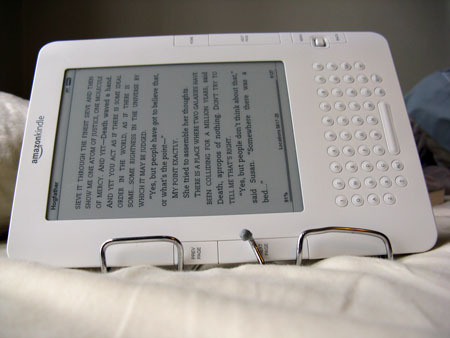 This may allow them to continue reading at night, so I’m really interesting your solutions for a different reason. that is an awesome idea, I’m going to build one maybe put some sugru on the ends to make it a bit more professional looking. The page turn buttons drive me crazy on the kindle when Im in bed and when you try and get creative with a holding strategy you accidently hit the bloody page turn constantly. I’ve always had the same problem. I would sometimes even roll by every page so I could always lay the book. Of course I would usually notice halfway through dangling it but then not want to roll because I’m almost done anyways. 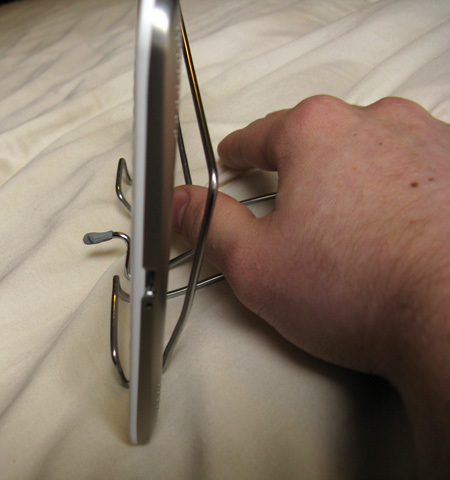 My new kindle changed all of that, but not perfect, so I’m copying your wire holder right now. Gracias por compartir este Dictamen. Saludos para usted. ¡Buen trabajo! Información muy útil Esta es una plataforma de blogs fresco. Thanks for your blog, I just subscribe your blog.